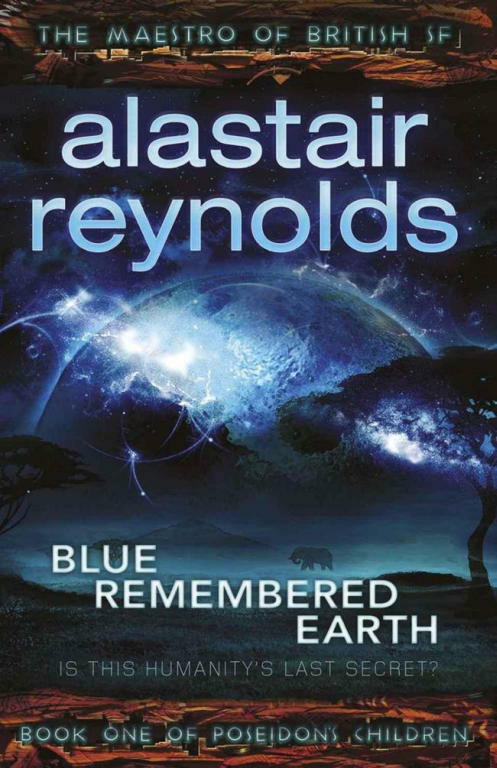 Blue Remembered Earth, by Alastair Reynolds, is the first in the Poseidon’s Children sequence. Set one hundred and fifty years in the future, in a utopian society in which African is the dominant geographical power on earth, the moon and Mars are colonised, and asteroids are mined for water and minerals, the story centres around one family. The Akinyas are wealthy and powerful family with varied business interests, but Sunday and Geoffrey want to pursue lives unconnected to the family business. Geoffrey wants to study elephants in the Amboseli basin and Sunday lives in an artists’ commune on the moon. When the reclusive and eccentric matriarch and founder of Akinya Industries, Eunice, dies she instigates a treasure hunt through the solar system. Sunday and Geoffrey follow clues that Eunice hid on the moon, on Mars, and finally on the space station where she spent her last decades. Their cousins, Hector and Lucas, are the ones that currently run Akinya Industries and are concerned that the mystery Eunice is set on revealing will be bad for the business. Along the way, Reynolds introduces us to his world and the players in it. Poseidon’s Children starts with a human level story and develops into space opera. Geoffrey and Sunday are ordinary people thrust into a game initiated by their grandmother, who was far from ordinary. It ends with a hint at what she might have done a hundred years ago, something that goes against all the principles of the society she lived in. I enjoyed this. It’s the first of Reynolds’ books that I’ve read and I understand that a utopian vision of the future is different for him. The worldbuilding was excellent and I liked the unique elements of it. It was a great demonstration of how to use plot and character to create the world rather than relying entirely on description. I will read more of these. Once book mountain is conquered, obvs. Some years ago, I found myself with hundreds of unread books due to buying more books than I was reading. I set myself a challenge to read all those books. I didn’t quite make it. I read a lot. I gave away a lot; ones I’d never read and classics that I could get free for my kindle (still largely unread). I went to FantasyCon 2015 this weekend and had a great time. It was my first time at the conference and I’ll definitely be going back. Highlights were: meeting publishers, agents and writers. free books! finding out about London-based writing groups. I went to ten workshops and panels covering topics such as managing your anxiety, fight scenes, the future of epic fantasy, marketing books, and religion in fantasy. Key learning points were: almost all of the successful published writers on the panels had day-jobs; and I still have some procrastination issues to work through. Plus lots of useful tips about writing and the business of writing. There were lots more, but you can never go to all the sessions at these events. Emma Newman‘s workshop around how anxiety gets in the way of writing was a real eyeopener and well-timed at the start of the Con. I didn’t think I had more than average fear of writing – over the years I’ve worked on insecurity about my talent, my right to a voice, thinking that no one would want to read my writing, fear of exposure and being seen. All those things are still there, but they’re examined, labelled and stuck in a box to keep them from being too disruptive. I do procrastinate though, and anxiety can show up as withdrawal and indifference, so I thought maybe I could learn something. And I did. I hope Emma Newman will do a workshop next year on fear of networking. It was daunting to go to the social activities by myself on the Saturday night, but SFF fans are lovely, kind people and it only took a few minutes before someone drew me into a conversation. I’m so pleased I went. 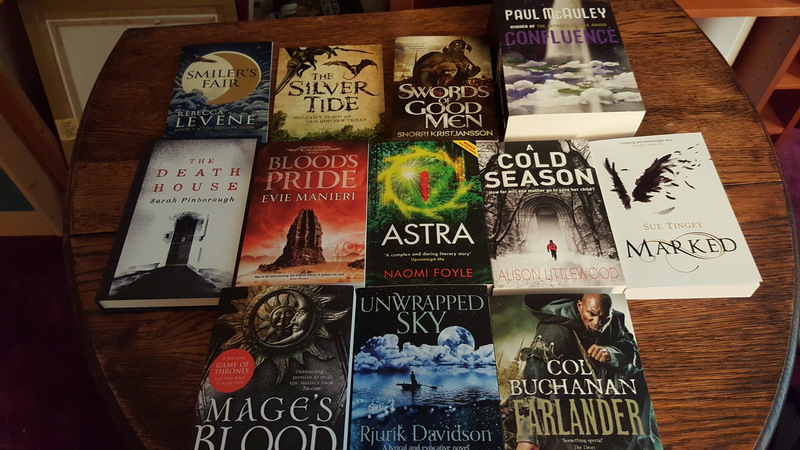 I have lots of reading to do, I’m very excited about finding out about lots of authors I’ve never encountered before. Watch out for the reviews!